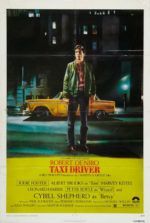 Set in 1960’s Ireland, Neil Jordan’s 1997 film The Butcher Boy revolves around juvenile delinquent Francie Brady, the product of an alcoholic father and manic depressive mother. Already damaged by a dysfunctional home life, Francie’s childhood is charged by the Kennedy years’ political controversies, specifically the atomic scare birthed in the Cuban Missile Crisis. Living every day as though it’s his last, Francie is a no-holds-barred bully and thief, but he’s also a dreamer. He and his best friend Joe spend their days dressing up like Native Americans, chasing after one another, stealing food, and chiseling away at the frozen water at the town fountain. Played by first-time actor Eamonn Owens, in a bold and lively performance for even the most experienced actor (so it’s more impressive that this was his first role), Francie cannot be wholly blamed for his self-destructive nature given his home life. His father (Stephen Rea from The Crying Game and V for Vendetta), once a musician, spends his days drunk, angrily spouting out curses against everything and everyone. Francie’s mother is equally disturbed; one day he comes home to find her with a chair on the kitchen table, holding a piece of rope. Shortly after, she’s sent away to a mental institution. Rather than address such issues with a much-needed emotional reality check, Francie takes his often paranoid frustration out on schoolmate Phillip Nugent and his mother (Fiona Shaw). Francie views Mrs. Nugent as the epitome of evil and Phillip as her little minion, though Mrs. Nugent is no saint. She has her brothers, two grown men, find young Francie and beat him, and then herself launches insults at the boy like missiles, calling his family “pigs”. After seeing a sci-fi picture at the cinema, Francie convinces himself Mrs. Nugent is some bizarre combination of alien and communist. Meanwhile, Francie and Joe remain inseparable. As Francie’s parents become less and less reliable, he considers Joe all the more important, like family, when they become blood brothers as children sometimes do. But Joe doesn’t approve of the way Francie rides Phillip and Mrs. Nugent. Sent off to a Catholic disciplinary school headed by two men of the cloth, one decent (Brendan Gleeson), and the other who insists on dressing up Francie in a bonnet, Francie receives a letter from Joe that suggest he’s become friends with… gulp… Phillip. While searching for answers to why Joe would befriend Phillip, Francie begins to see visions of the Virgin Mary (ironically played by Sinéad O’Connor, the Irish musician who once ripped up a photograph of Pope John Paul II on SNL, singing “Fight the true evil!”). A symptom of his sickness, the Virgin never warns Francie against his roughneck behavior. Refusing to accept any tragedy or betrayal in his life, Francie accommodates by losing himself in delusion. Jordan compares Francie to an atomic bomb; the film cuts from critical moments in Francie’s life to 1960’s test detonations of “the big one”. Jordan also blends fantasy with reality in a stark manner, linking Francie with his father’s self-destructiveness and his mother’s delusion. Throughout the film, Francie’s enemies, most notably Mrs. Nugent, are portrayed with large insect-like alien heads—they are the corrupted results of atomic testing and commie infiltration. But the most vigorous element must be Stephen Rea’s narration. Playing both Francie’s father and providing the voice of Francie looking back from adulthood, Rea has never been so expressive. Conversations ensue between Owens and Rea, the protagonist and the voice in his head, and the commentary the voice provides exposes us to Francie’s surreal view of the world. Of course, as viewer’s we’re also aware of the tragedy behind Francie’s situation, since the film is ultimately about watching the breakdown of young boy from carefree adolescent to forever damaged goods. Francie’s bomb eventually does go off and Neil Jordan’s class as a director miraculously sustains sympathy for the boy, even through the most disturbing turns. Jordan’s work often creates compassion for traditionally unsympathetic characters: in Interview with the Vampire, Brad Pitt’s vampire Louis was the most endearing vamp in movie history; with The Good Theif, Jordan’s remake of Jean-Pierre Melville’s iconic Bob le flambeur, Nick Nolte plays a charismatic drug and gambling addict; and with Jordan’s best film, The Crying Game, the director turned the ill-fated love between an IRA operative and a trans individual into one of the best romances of the 1990s. In his review, Roger Ebert compared The Butcher Boy to Stanley Kubrick’s A Clockwork Orange, linking Francie to Clockwork’s Alex, played by Malcolm McDowell. Ebert said that he felt distance by both characters, regardless of cinematic merit. But even though both are murderers and delinquents, Francie and Alex are human nonetheless. Furthermore, I’m not sure that we’re ever supposed to feel genuine sympathy for Alex, whereas certainly there’s a component of childhood misfortune involved in Francie’s twisted story. Not to justify his criminality, but Francie’s victimization, oddly pleasant energy, and dysfunctional family somehow dismiss his behavior, unlike Alex, who seems to have a natural born (human) instinct for violence. 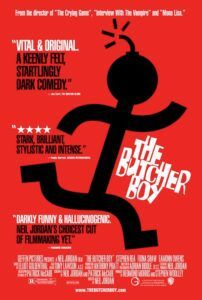 The Butcher Boy is bold and often shocking, but the film’s playful humor crashes against the dark, manic, sometimes depressing material and makes for an oddly enjoyable-if-devastating drama. 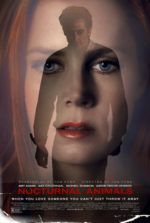 Had the events in the film been treated with a grave or humorless approach, certainly this could be one of the most unsettling and miserable films ever made. Instead, the experience’s energy makes it one of the director’s best, most purely entertaining films. In terms of playfulness and tone, Jordan has never demonstrated such audacious filmmaking. So often the energy of his films reside in the internalization of emotions and thus the audience’s interpretation of them; here, the emotions are splattered across the screen in all their sordid detail and impulse, but still remain complex. It’s a stirring change of pace for Jordan, and a unique entry in his impressive career.